Before we begin to explore the specific adaptations of Chironex fleckeri, there is a general adaptation that this species shares with all members of its phylum. This trait is radial symmetry. This kind of symmetry means that more than one plane of symmetry goes through the animal. Radial symmetry is also present in Aurelia aurita. This allows the jellyfish to reach out in all directions and also receive stimuli from all directions, helping them capture prey and avoid predators. One adaptation that Chironex fleckeri has acquired through evolution is the possession of 24 complex eyes. These complex eyes are composed of a cornea, lens, retina, and pigmented cell, just like yours and mine. The most interesting detail about this sense, however, is that this jellyfish does not have a brain to process the images these eyes receive! 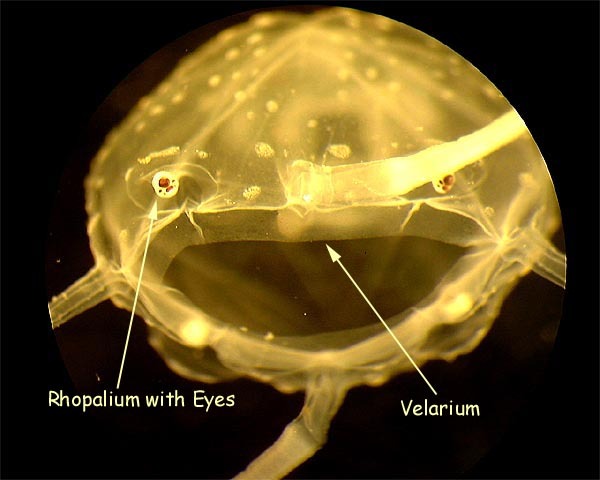 If you were to look at this box jellyfish, you would find their eyes located on the rhopalia, which are sensory organs on the bell. Each of these rhoplaium house 2 camera-type lensed eyes, an identical pair of slit eyes, and an identical pair of pit eyes. 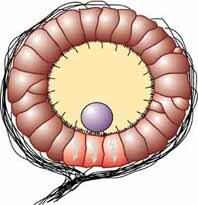 All three of these types of eyes possess ciliated photoreceptors, but even though they have these photoreceptors, studies have shown that this species does not prefer one color of light over another. However, they do show preference of lighter colored objects compared to darker colored objects. Being able to distinguish from light and dark objects allows this organism to avoid things such as environmental barriers, such as rocks, and predators. These eyes are not able to produce an image like a human eye, but they can detect motion which gives this species a major advantage over others of its kind. Along with the rhopalia housing the 24 complex eyes, it also holds their balance organ called a statocyst (shown left). This organ allows the jellyfish to maintain medusal orientation when moving throughout the ocean water. This organ contains a special crystal called a statolith. This statolith acts the same way otoliths work in human ears. They both allow for coordination and maintenance of balance while moving. Another adaption that this species has is its ability to detect vibrations. Not only does this allow organisms of this species to detect movement of potential prey, but it also allows them to detect movement of predators in their close proximity. This box jellyfish is a diploblastic animal, meaning it has two layers of tissue. These tissues are cells acting together in a coordinated fashion. Phylum Cnidaria is the first group of animals to represent this characteristic and separates them from earlier animals known as sponges. These layers include the ectoderm, or epidermis, and the endoderm, also called the gastrodermis. Between these two layers of tissue lies the mesoglea, a jelly-like substance that makes up much of this jelly's structure. 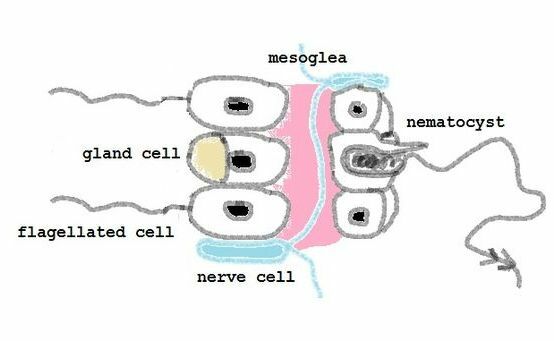 Within this mesoglea is where this species' primitive nervous system is located. Jellyfish have a nerve net in which their sensory neurons are dispersed throughout the entire body of the organism. These nerve cells are connected by crossing each other, creating the net-like look. This network of nerves allows signals to travel from cell to cell without reaching a centralized region. Even though the signal is not transmitted very quickly, it is an important adaptation to this species because they do not have any cephalization, a centralized head region. Along with this extensive network of nerve cells, this jellyfish has a complex nerve ring that connects the four bases of tentacles and the four rhopalia. Studies have shown that this nerve ring aids in communication between the swim pacemakers on each 'side' of the box jelly's cube-shaped bell along with being a point of attachment. Another adaptation that this species has is the possession of a velarium. This is a ring of tissues that lines the entire bottom, inner region of the bell. This is special tissue that contracts and narrows the bell's opening during muscular contractions while the jellyfish is swimming. Not only does this make the jellyfish more aerodynamic when swimming through the water, but it increases the efficiency of the jet-like pulsations that the jellyfish performs to move through the water faster than any other class of jellyfish. This box jelly can use these adaptations to better capture their prey. To learn more about Chironex fleckeri's eating patterns, continue on to the Nutrition page. Want to start all over? Go back to the Home page!